An unnamed Russian billionaire has splashed out $99 million on an ultra-luxe Moscow penthouse around the corner from the Kremlin. 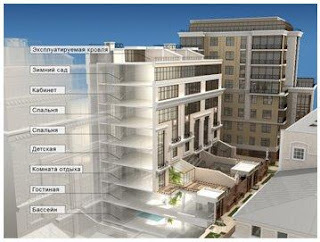 The seven-story, 14,000-sq.-ft. oligarch's aerie features five bedrooms, five baths, an indoor pool, separate children's floor and winter garden on the roof. It's located in the chic Chistie Prudy Residence complex, which has underground parking, private security and a water purification system. "For Moscow, it's an absolute record," the townhouse's real estate firm's spokesman Ruslan Barabash tells Reuters. The interior is done in a Moorish style with marble mosaics, myriad columns and arches, Moroccan-style lighting and garish touches galore. Click "Read More" for an interesting perspective and a slide of the photos. The average Filipino's income is Php 8,000 monthly. It will take him approximately 48,469 years to purchase the mansion.